A brand new website, based on our responsive design framework (called Flex), was made live for Vartrust Property Brokers. Vartrust Property Brokers is based in Midrand, Gauteng, and specialises in the sales and rentals of commercial and residential property in areas like Centurion, Krugersdorp, Midrand, Sandton, Randburg, Roodepoort and Pretoria. Renee Varejes is the owner and founder of Vartrust Property Brokers and has and has a qualified team that works for the brand. The Vartrust team are confident in their level of service and ethics and promises hard work, smart ways in which they operate and effective communication to their buyers and sellers. Renee chose our Folio Theme for Vartrust's new website and added additional content pages and features to this template to cater for her business' needs. 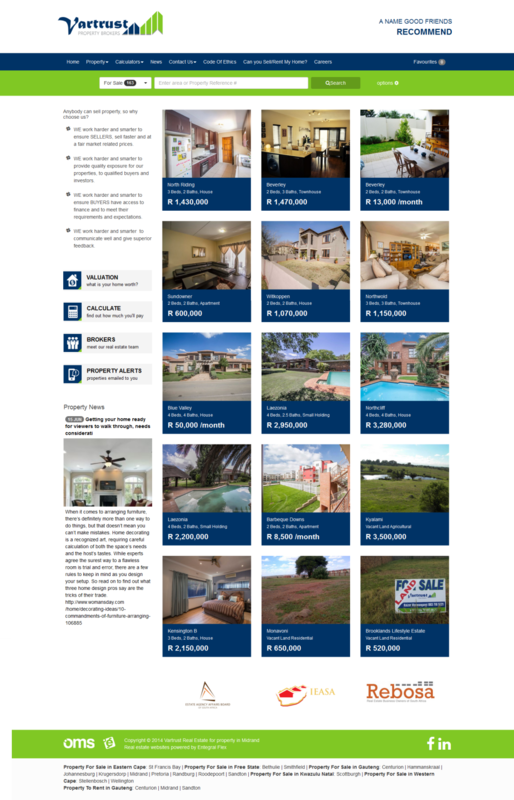 Visit www.entegral.net for more information on how you can create and manage your own real estate website.